Who would have thought that the most socially conscious comic series of recent years would be a reincarnation of a 1960s cartoon? 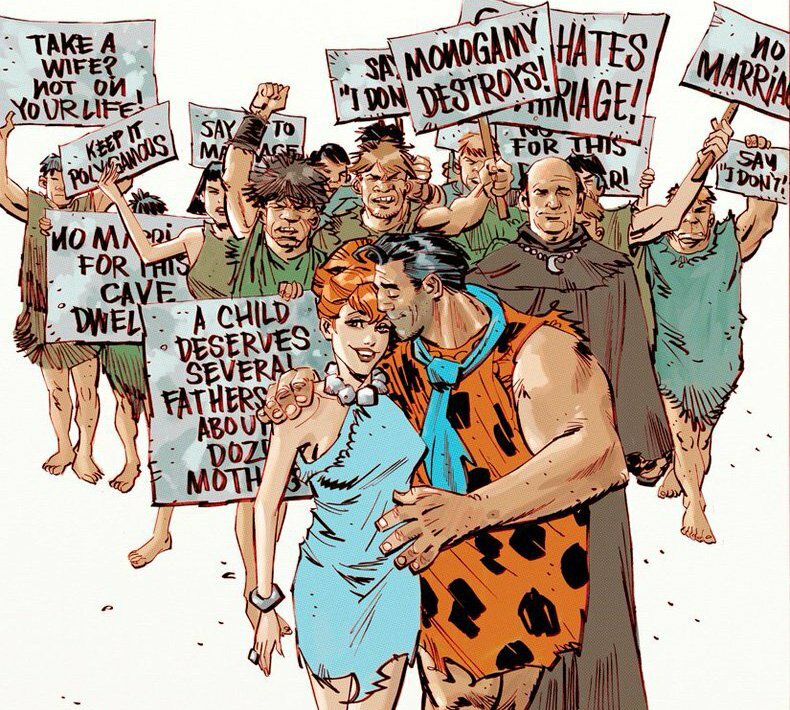 In The Flintstones, volume 1 (collecting issues 1 through 6), Mark Russell and Steve Pugh manage to cover an unprecedented number of social issues, including racism, exploitation of the uneducated, religion, gender equality, marriage rights, homophobia, capitalism, the treatment of war veterans, and infertility. No subject matter is off limits (not even Trump and the recent US elections!). This series does not simply carry on with a story and characters we know and love. 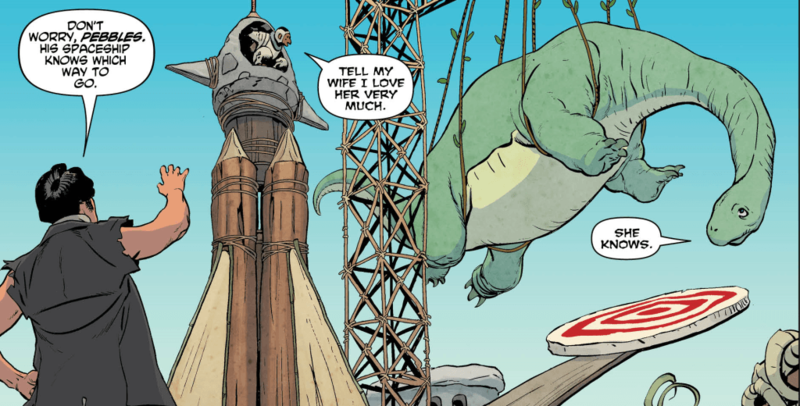 Instead, The Flintstones reimagines these characters and delivers something quite different. 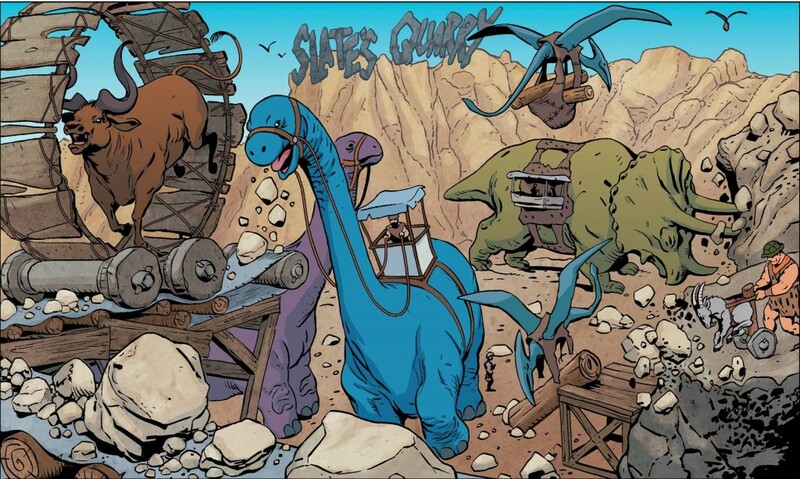 While many elements of the original show are retained – such as the Stone Age puns, modern gadgets with a Stone Age twist, and the catch phrase ‘Yabba-dabba-doo!’ (though the latter is given more substance, set up as a ‘nonsense phrase’ for war vets to use in diffusing tense situations) – the tone and focus of the comic are very different. Perhaps the only obvious social issue that has been carried over from the original is workers’ rights and the negative portrayal of fat cat Mr. Slate. It is worth mentioning the artistic style and the character development in this series. Given that the source material was a hand-drawn animation, the creators could easily have simply recreated that style again. Instead, Pugh decided to give the characters a more realistic makeover. This works well with the more serious tone of the series while also adding absurdity to the setting – when everything is drawn realistically, it feels even sillier to have creatures for household appliances. 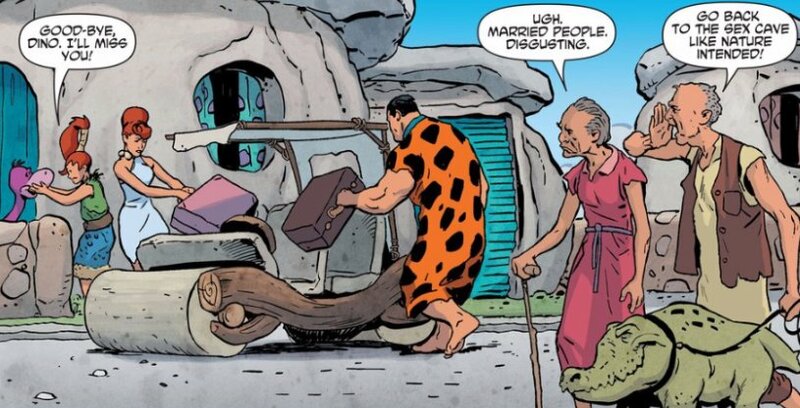 I have long been a fan of fiction using alternate times and worlds as a way to critique present society, but I admit that I was surprised to find such a good example of this trope in The Flintstones. Its mockery of religion is flawless. When their god does not answer the priests, they think on their feet, grabbing the nearest thing they can find and calling it their new god. Unfortunately for them, their congregation is not so easily fooled, recognizing the new god, ‘Peachies’, as a common household vacuum cleaner. To avoid any future embarrassment, the priests create their own god, an invisible one. No one can prove them right or wrong if no one can see the god! Marriage and gender equality are at the heart of many of the storylines featured in the collection. In Fred and Wilma’s world, monogamy and marriage is not the usual set-up. They are ridiculed for their commitment and face similar bigotry we see today against gay marriage (‘If we allow men and women to marry, how long before they start marrying dinosaurs and street lamps? It’s a slippery slope.’). And when Fred’s gay friends – Adam and Steve (love that they used the homophobic slogan as a lampoon!) – want to get married, Fred points out the hypocrisy in those wanting marriage for one group of people but not another. While in the series, Wilma had little to do outside of being a housewife for Fred, Russell and Pugh have created a well-rounded character. 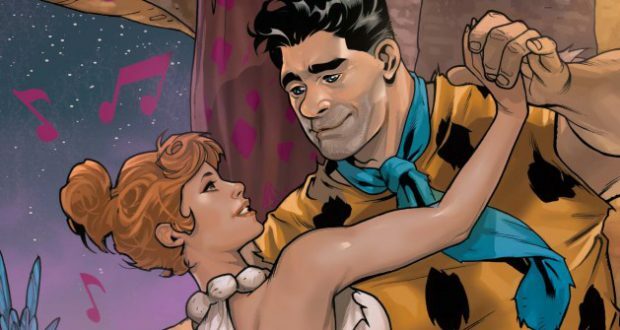 They use both the two main relationships of the series to explore gender equality – from Wilma’s role being more than just raising children, to Fred’s concerns about his meager earnings, to Barney’s insecurity about his infertility. 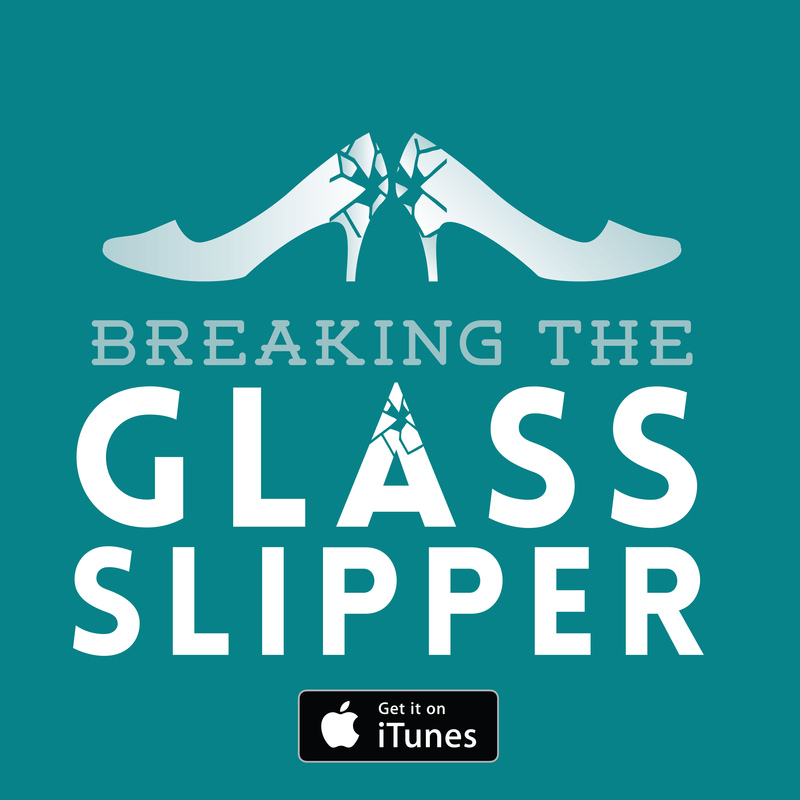 The series takes a level-headed approach to presenting issues on both sides of the gender equality issue; toxic masculinity is just as much a problem as sexism. Perhaps the most surprising and affecting issue the series tackles is that of war veteran welfare. Fred and Barney attend reflect on their years in the service, commenting on how their hero status was quickly forgotten as they were left to find work in an over-populated workforce as well as how they were tricked into an unnecessary war. Their pain at having been a soldier is more than living with the knowledge that they killed, but that they did so under false pretenses. Meanwhile, friends of theirs that are unable to cope with their PTSD are let down by under-resourced support systems and a society that doesn’t value their efforts. This comic couldn’t be any more on the nose if it tried. Verdict: The Flinstones vol. 1 is a gut-punch of a comic. There is more philosophical social commentary in these pages than I’ve read in a reputable newspaper for months. This is a must read. 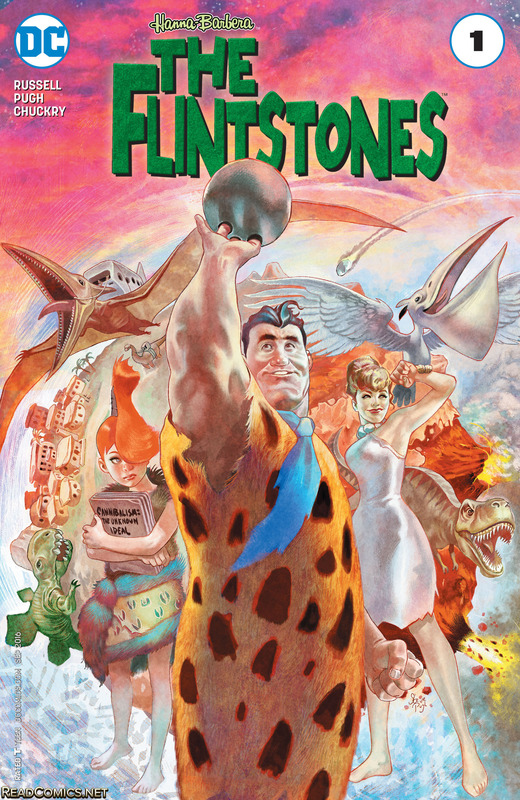 The Flintstones volume 1 is published by DC Comics on March 28th. Greg Rucka’s Veil: A mysterious woman, is she hero or villain? Electra Woman and Dyna Girl: Female superheroes are just superheroes Love and Friendship: Does this woman always get her way? Shadows of Self by Brandon Sanderson: Stop talking to your hat and get over here. Next: What makes a good short story collection?